It feels really cool to be featured on a Japanese newspaper. During the trip I was interviewed a couple of times, once by the Maze River manager for their newsletter, and then by the local newspaper. They were very interested in the fact that tenkara, which probably originated on the rivers in the area, was now being widely adopted in the US and other parts of the world. According to Chikara, my good friend in Japan, the article was very well written. He was impressed by the polite Japanese language used in it. Of course, one of the thousand more reasons I have to learn Japanese. After fishing on the Maze River (Mazegawa), which turned out to be a bit blown out from previous days’ rain, we sat inside the Mizube no Yakata fishing center for the interview. 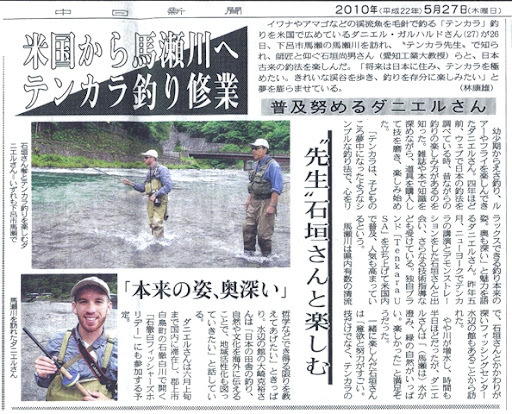 The reporter asked questions of me and Dr. Ishigaki, and we had a good conversation about tenkara in the rest of the world. Click on to see the article translation. “I’d like to live in Japan in the future and master tenkara fishing. I’d like to walk on the beautiful stream in Japan and enjoy fishing the most. ”, says Daniel about one of his dreams. Through the years, Daniel enjoyed the live bait fishing, lure fishing, and fly fishing in the past. When he was researching the history of Japanese fishing about four years ago, he has learned that there is the way of enjoying fishing which has been around for ages. After acquiring the knowledge from magazines and books, he bought the tenkara gear, brushed up his fishing skills and started enjoying the fishing. “Tenkara fishing is a very simple fishing method, like what I did as a child, I was so into it. It’s a fishing style that can make you relax, yet it’s very pure.” He talks about why tenkara appeals to him. Daniel met Dr. Ishigaki last May in New York, when Dr. Ishigaki went there to give a speech and demonstration on tenkara. Daniel has been learning more about the technique from Dr. Ishigaki. He has started his own brand “Tenkara USA” to spread tenkara fishing in the U.S. and it’s getting more popular. They visited Maze River, one of the best streams in the prefecture, and where there is also the fishing center “Mizube no Yakata”, to which Dr. Ishigaki has a deep connection. Daniel is going to stay in Japan until the middle of June. He is planning to attend the “Itoshiro Fisher’s holiday” held in Itoshiro River, Itoshiro-cho, Guze-shi.